South Africa are set to host the Sri Lankan Lions at the Kingsmead, Durban for the third ODI of the five-match series. The Proteas are just a win away from sealing this series while Sri Lanka has been in poor form recently in the 50-over format. South Africa, who have outplayed the visitors in both the previous encounters, would be eyeing to get the right combinations in their squad ahead of the ICC World Cup 2019. South Africa registered a thumping 113-run victory against the sloppy Sri Lankan side. Their top three batsmen have been on fire in this series and yet again scored the majority of runs in the previous encounter. The hosts batted well in the first innings to set a competitive total of 251 runs on the board. 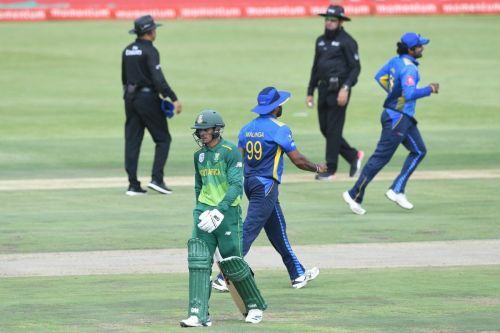 In the second innings, South African bowlers blew the Lankan batting lineup away in haste as they were bundled out for just 138 runs. The Proteas would be hoping to dominate the upcoming tie and seal the series so that they could experiment with the starting lineup in the remaining two games. On the contrary, Sri Lanka has struggled to find their feet in the limited overs format over the in recent times. Since the beginning of this year, Sri Lanka has lost all the five ODIs they have been a part of. After being hammered in the first two ODIs, the visitors would be eyeing to bounce back heading into this must-win match. With the ICC World Cup in sight, the Islanders have many boxes to tick as they remain highly inconsistent with their performances. Sri Lanka showed some character and determination against a quality side when they became the first Asian team to clinch a test series in South Africa. However, this ODI series proved once again that they lack real match-winners in their ranks which could haunt them in the World Cup. Kagiso Rabada could be rested in this match to make way for Dale Steyn. The visitors may make a few changes to strengthen their fragile batting lineup. South Africa: Reeza Hendricks, Andile Phehlukwayo, Tabraiz Shamsi, Willem Mulder, Anrich Nortje, Quinton de Kock, Faf du Plessis, David Miller, Lungi Ngidi, Kagiso Rabada, Rassie van der Dussen.